Now a days, any job requires basic Excel skills. These basic Excel skills are – familiarity with Excel ribbons & UI, ability to enter and format data, calculate totals & summaries thru formulas, highlight data that meets certain conditions, creating simple reports & charts, understanding the importance of keyboard shortcuts & productivity tricks. Based on my experience of training more than 5,000 students in various online & physical training programs, the following 6 areas form the core of basic Excel skills. When you open Excel, this is how it looks. There are 5 important areas in the screen. 1. Quick Access Toolbar: This is a place where all the important tools can be placed. When you start Excel for the very first time, it has only 3 icons (Save, Undo, Redo). 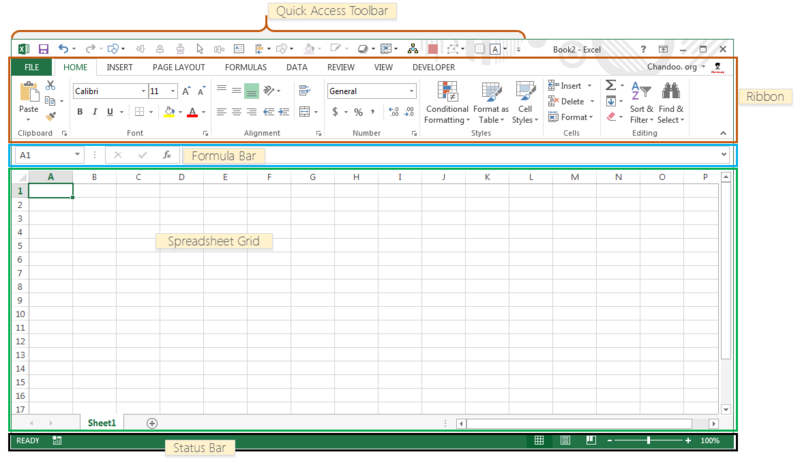 But you can add any feature of Excel to to Quick Access Toolbar so that you can easily access it from anywhere (hence the name). 2. Ribbon: Ribbon is like an expanded menu. It depicts all the features of Excel in easy to understand form. Since Excel has 1000s of features, they are grouped in to several ribbons. The most important ribbons are – Home, Insert, Formulas, Page Layout & Data. 3. Formula Bar: This is where any calculations or formulas you write will appear. You will understand the relevance of it once you start building formulas. 4. Spreadsheet Grid: This is where all your numbers, data, charts & drawings will go. Each Excel file can contain several sheets. But the spreadsheet grid shows few rows & columns of active spreadsheet. To see more rows or columns you can use the scroll bars to the left or at bottom. If you want to access other sheets, just click on the sheet name (or use the shortcut CTRL+Page Up or CTRL+Page Down). 5. Status bar: This tells us what is going on with Excel at any time. You can tell if Excel is busy calculating a formula, creating a pivot report or recording a macro by just looking at the status bar. The status bar also shows quick summaries of selected cells (count, sum, average, minimum or maximum values). You can change this by right clicking on it and choosing which summaries to show. Handling Data would be one of the main reasons why you are using Excel. Excel is quite intuitive and simple to use when it comes to typing data or handling it. Because of its grid nature, it can store & manage thousands of data points with ease.Built in features like copy, paste, find, highlight, go to, styles etc. make the process of maintaining data very easy for you. Formulas make Excel smart. Without formulas, Excel is just like a massive grid where you can keep data. Using them you can calculate totals, summaries, answer questions and gain insights. Built in features like Autosum make it very easy to write formulas for your needs without thinking or learning much. Conditional formatting is a powerful feature in Excel that is often underutilized. By using conditional formatting, you can tell Excel to highlight portions of your data that meet any given condition. For example: highlighting top 10 customers, below average performing employees etc. While anyone can set up simple conditional formatting rules, an advanced Excel user can do a lot more. They can combine formulas with conditional formatting to highlight data that meets almost any condition. The number 1 reason why Excel is used in business is this – to create a report or chart. And this is also where a lot of beginners struggle. While entering data, calculting totals or formatting tables is easy, making a report is often a very complex task that requires days of learning & hours of work. Fortunately, it is not all tha complicated if you learn it right. Start with below links. How to select correct chart for any situation? It is not enough to know various features of Excel. As a beginner, it helps to know how to use Excel productively. This includes knowing important keyboard shortcuts, mouse shortcuts, work-arounds, Excel customizations & how to make everything looks slick. Once you know the basics, chances are you will be asking for more. The reason is simple. Anyone with good Excel skills is always in demand. Your bosses love you because you can get things done easily. Your customers love you becuase you create impressive things. Your colleagues envy you becuase your workbooks are shining and easy to use. And you want more, because you have seen the amazing results of Excel. This is where learning Excel pays off. I highly recommend you to join my most comprehensive Excel training program – Excel School. It is an entirely online course that can be done at your own pace from the comfort of your home (or office). The course has more than 24 hours of training videos, 50+ downloadable workbooks, in-depth coverage of all the important areas of Excel usage to make you awesome. To date, more than 5,000 people have enrolled in Excel School and became champions at their work. Click here to learn more about Excel School Program.